"The zombies were having fun...The party had just begun..."
Hand #68: Hugo Pingray received a walk in the big blind. Hand #69: Claas Segebrecht raised to 1.6 million and Sean Drake three-bet the button to 3.7 million. Segebrecht folded and Drake was pushed the pot. Hand #70: Hugo Pingray raised to 1.6 million from the button and won the blinds and antes. Hand #71: Hugo Pingray opened to 1.75 million and Sean Drake made the call to see a flop fall with Drake checking to Pingray. Pingray pushed out a bet of 1.8 million only to have Drake raise to 4.3 million total. Pingray went into the tank for close to two minutes before making the call as the landed on the turn. Drake announced a bet of 7.2 million and pushed out the allotted chips as Pingray went into the tank for close to two minutes before folding as Drake tabled his for a complete airball. "They did the mash, they did the monster mash..."
Hand #64: Joseph McKeehen raised to 1.6 million in the cutoff and Hugo Pingray called from the big blind. The flop fell and McKeehen took it down with a bet of 1.25 million. Hand #65: Sean Drake opened to 1.7 million on the button and Hugo Pingray three-bet to 4.4 million from the small blind. Drake gave it up and Pingray won the pot. Hand #66: Hugo Pingray raised to 1.7 million on the button and Claas Segebrecht called from the big blind. The flop fell and Segebrecht checked to Pingray who continued for 2 million. The landed on the turn and Segebrecht led out for 3.2 million. Pingray folded, giving Segebrecht the pot. 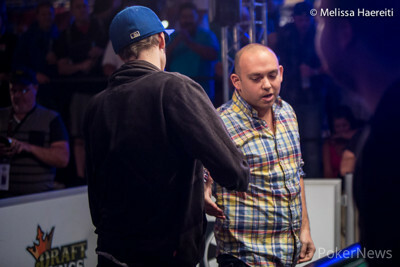 Hand #67: Joseph McKeehen raised to 1.6 million on the button and took down the pot. "They did the mash, it caught on in a flash..."
Hand #60: Claas Segebrecht opened to 1.6 million from the button and Hugo Pingray called from the big blind to see a flop. Segebrecht bet out 1.35 million and Pingray instantly folded. Hand #61: Hugo Pingray opened to 2.1 million from the small blind and won the big blind and antes. Hand #62: Sean Drake opened the cutoff to 1.7 million only to have Hugo Pingray three-bet 3.9 million from the button. With the action on Joseph McKeehen, he moved all in for 15 million and both Drake and Pingray instantly folded. Hand #63: Hugo Pingray raised to 1.7 million from the cutoff only to have Claas Segebrecht three-bet to 4.1 million total from the small blind. Pingray then moved all in and Segebrecht quickly called. With Pingray in great shape to double, the flop rendered Segebrecht drawing dead to runner runner. The turn of the and river of the ensure Pingray the double. "The monster mash, it was a graveyard smash..."
Hand #56: There was a dead button this hand. Claas Segebrecht raised to 1.6 million in the cutoff, Sean Drake three-bet to 3.1 million in the small blind, Segebrecht four-bet to 7.4 million and Drake folded. Hand #57: Sean Drake raised to 1.8 million on the button and took down the pot. Hand #58: Hugo Pingray raised to 1.7 million on the button and collected the blinds and antes. Hand #59: Claas Segebrecht raised to 2.4 million in the small blind and received no action. Hand #55: The action folded to Thayer Rasmussen in the small blind, and he moved all in for 10,050,000 and Sean Drake called from the big blind. With Rasmussen at risk, but in the lead, the flop gave Drake outs to a straight. The turn of the changed little, but when the spike on the turn, Rasmussen would be sent to the rail in 5th place for a $356,620 payday. 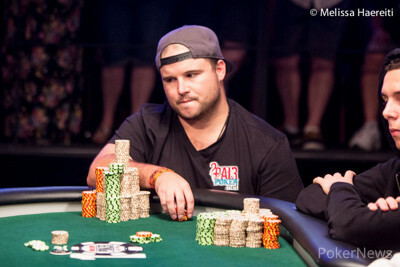 Hand #52: Claas Segebrecht raised to 1.2 million from under the gun and took down the pot. Hand #53: Claas Segebrecht received a walk in the big blind. Hand #54: Hugo Pingray raised to 1.3 million in the cutoff, Joseph McKeehen called on the button and Claas Segebrecht three-bet to 4.1 million in the small blind. Both Pingray and McKeehen folded, giving Segebrecht the pot. "The ghouls all came from their humble abodes..."
Hand #48: Thayer Rasmussen raised to 1.2 million from under the gun and Claas Segebrecht called from the big blind to see a flop fall. Both players checked as the landed on the turn and Segebrecht checked to Rasmussen who bet out 1.35 million with Segebrecht calling. The river landed the and Segebrecht checked for a third time with Rasmussen checking behind. Segebrecht tabled his for second pair and scooped the pot once Rasmussen mucked. Hand #49: Sean Drake opened to 1.3 million first to act and collected the blinds and antes. Hand #50: Claas Segebrecht opened to 1.2 million from the button and Sean Drake defended his big blind to see a flop fall with Segebrecht betting out 1.55 million with Drake check-calling. The turn landed the and both players checked as the completed the board on the river. Drake checked and Segebrecht bet out 1.7 million. Drake called, and then mucked once Segebrecht tabled his for top pair. Segebrecht climbs to roughly 32 million as Drake slips to 14.1 million. Hand #51: From the small blind, Sean Drake limped in and Hugo Pingray checked his option to see a flop fall. Drake pushed out a bet of 800,000 and Pingray raised to 2.1 million only to have Drake three-bet to 6.1 million. Pingray eyed what Drake had remaining in his stack before switching his gaze back towards the flop. After a few moments, Pingray announced he was all in and Drake called for his 13.45 million total. With Drake ahead with his overpair, he would be up against Pingray's straight draw until the on the turn increased the outs Drake needed to fade to an additional six. Fortunately for Drake, the river landed the to ensure his double to over 28 million as Pingray slipped to 26 million in chips. Hand #43: Sean Drake opened to 1.4 million from the cutoff only to have Hugo Pingray three-bet his button go 3.2 million. Action folded back to Drake who four-bet shoved for 12.75 million. Pingray folded and Drake collected the pot. Hand #44: Joseph McKeehen raised to 1.2 million on the button and took down the pot. Hand #45: Hugo Pingray raised to 1.2 million from under the gun and took down the pot. Hand #46: Claas Segebrecht raised to 1.2 million from the cutoff and Thayer Rasmussen three-bet to an unknown amount, but it was enough to win the pot. Hand #47: Sean Drake raised to 1.3 million on the button and took down the pot. With each player sitting behind a mountain of chips, the tournament directors have considered introducing a bigger denomination chip from an entirely different set of WSOP chips. Recently WSOP Tournament Director Jack Effel came over to the Monster Stack final table, and when a hand finished, he grabbed some of Claas Segebrecht's oreo-colored 50,000-denomination chips and mixed them up with a few yellowy-beige 250,000-denomination chips to see if they could be told apart. Tournament Director Charlie Ciresi stood at the far end of the table and shook his head from left to right to indicate that they looked virtually the same from a distance. Effel took back the 250,000-denomination chips and stated, "they're just going to have to play with big stacks!" Ciresi then added, "that's why it's called the Monster Stack!" When the Monster Stack event was added to the World Series of Poker schedule, players like Lynne Beaumont were the target audience for one of poker's most innovative tournaments. The British-born Beaumont plays the game for passion as much as for prize money — but she is no slouch on the felt, amassing $216,687 in earnings over 88 live cashes since 2005. Predominately playing small buy-in tournaments between $100 and $500 in London or Las Vegas, Beaumont has 11 first-place results on her record, but it was last year that she nearly made the bracelet breakthrough. 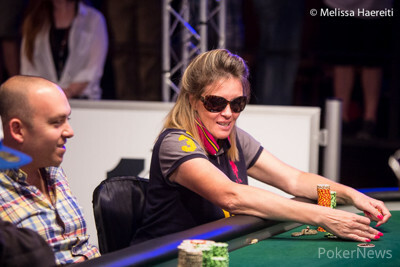 After playing in the WSOP Ladies Championship for a five years prior, Beaumont notched her first WSOP cash in the 2013 Ladies Championship, where she nearly made the final table before bowing out in 11th place. PokerNews: Last year you added your first WSOP cash to a long list of minor results. Tell me about that experience. Lynne Beaumont: That was my fifth or sixth time playing in the Ladies, and it's only the Ladies I've ever played except for the Seniors the year before, I played for the first time. And I played the Main Event a couple of years ago, and I bubbled third from the money. PokerNews: Prior to that deep run you had put up solid results in London's small buy-in tourney circuit. 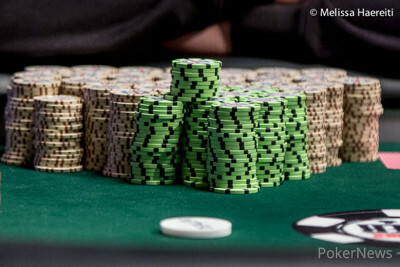 Did the close call on the WSOP stage motivate you to return for another crack at it? Yeah, lots of bits and pieces but nothing big, you know, so this is just awesome. It's amazing... the trouble was though, I was so torn. Because I wanted to play the Ladies and do better, and then they go and clash this so it was such a shame. I said 'I'll play this, and if I get through to Day 2 then the Ladies is out the way, and if not I'll play the Ladies.' I cruised to Day 2, so this is just a dream come true. PokerNews: How did you manage to make it through the massive field, and how did you enjoy the experience of a new tournament addition like the Monster Stack? I mean, I have been playing well to be quite modest, but I've been playing well, been out here and I've got lots of results. So I just said I'll only play the Ladies unless I get something going in the smaller tourneys. I haven't been hitting the top-3 spots though, so of course then you don't really get enough money. I've been playing well and so this is like 'wow,' and I've only had... before today, I only had one all in I think, so this is just awesome. "From my laboratory in the castle east..."
Hand #37: Hugo Pingray raised to 1.4 million in the small blind and Joseph McKeehen three-bet shoved for 13.35 milion. Pingray folded and McKeehen took down the pot. Hand #38: Thayer Rasmussen raised to 1.2 million from under the gun and Joseph McKeehen reraised all in for 15.15 million. Rasmussen folded and McKeehen collected the pot. Hand #39: Hugo Pingray raised to 1.35 million in the cutoff and took down the pot. Hand #40: Claas Segebrecht raised to 1.2 million on the button and took down the pot. Hand #41: Thayer Rasmussen opened to 1.2 million on the button and Sean Drake three-bet shoved for 13.8 million from the small blind. Rasmussen folded and Drake won the pot. Hand #42: Sean Drake raised to 1.4 million on the button and Joseph McKeehen called from the big blind. They checked to the river of a board where McKeehen bet 1.75 million. Drake called, but mucked when McKeehen tabled for a pair queens. "He did the mash, he did the monster mash..."
Hand #34: Hugo Pingray opened to 1.2 million and picked up the blinds and antes. Hand #35: Claas Segebrecht raised to 1.2 million from the cutoff and won the blinds and antes. Hand #36: From the hijack, Claas Segebrecht raised to 1.2 million and Lynne Beaumont moved all in from the button for 6,150,000. Hugo Pingray cold-called from the big blind and Segebrecht folded. With Beaumont racing for her tournament life, the dealer would spread a flop to launch Pingray into the overwhelming lead and leave Beaumont with outs to running cards to complete Broadway. The dealer delivered the on the turn to render Beaumont drawing dead as the completed the board on the river to send Beaumont to the rail in 6th place for a $273,090 payday.